Early Childhood faculty attended a presentation during the first week of school on how to use classroom websites to communicate with parents while involving students in the process. 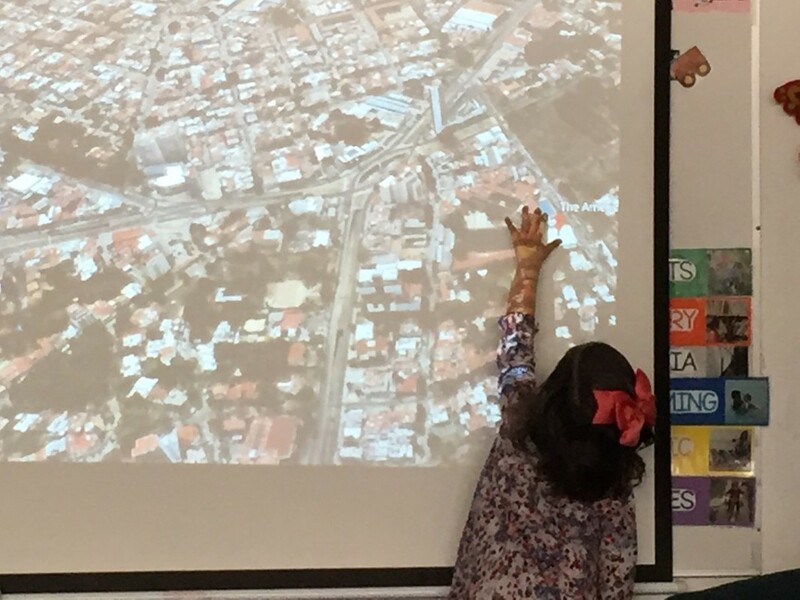 "Ese niño no tiene pelo"
Finally, we used Google Maps to find Guadalajara and then we zoomed out to find the countries the children in the photos where from. 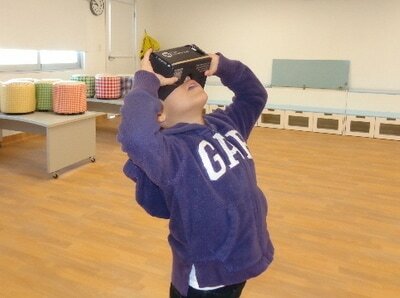 This app gave children the opportunity to travel to Japan, Africa, Alaska, South America, among other places. 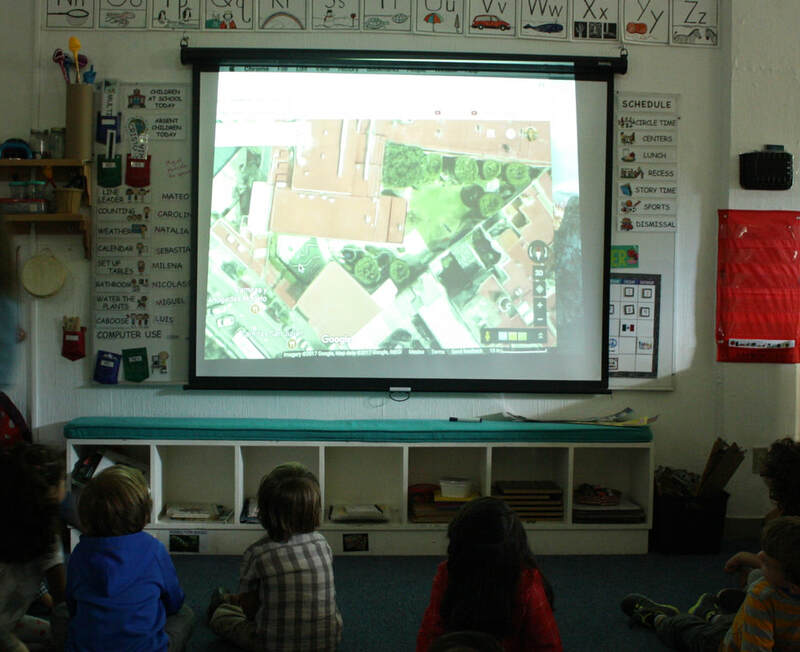 Once we found each country, we used street view so students could imagine standing on the streets of each place and have a quick look at the buildings and cities there. ​PK-9 students have been learning about patterns. 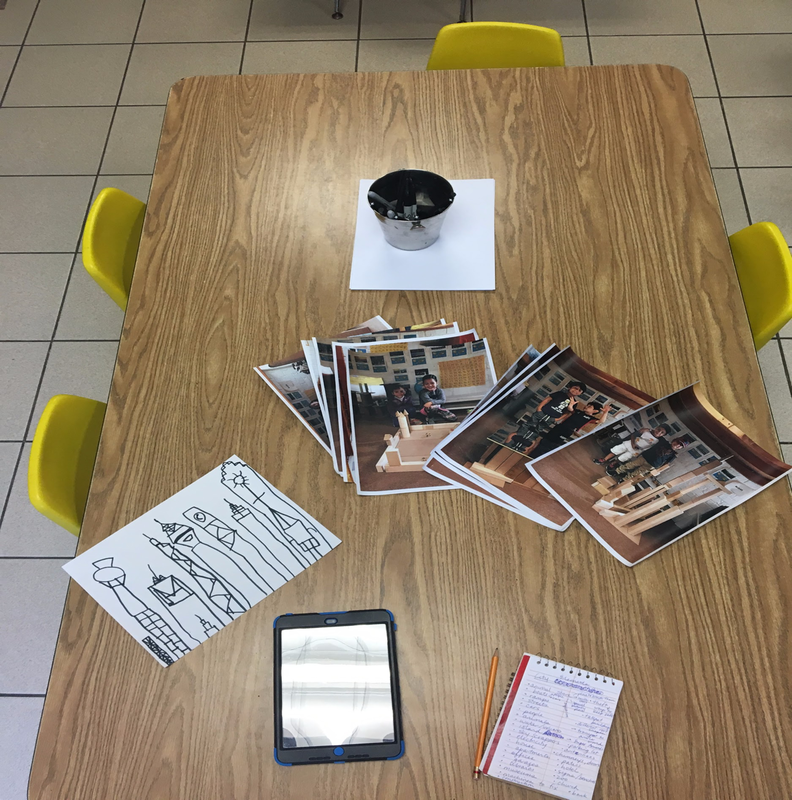 We went out in small groups around campus to look for patterns in our environment and children photographed these patterns with the iPad. After selecting which photographs they wanted to share with their classmates and parents on the Pk-9 website, we uploaded the pictures into a slideshow. 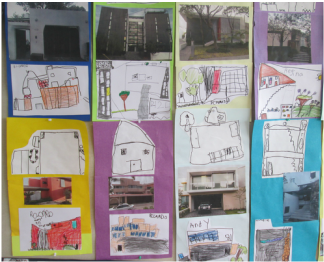 The students’ homework was to have parents check the website to see the slideshow and to look for patterns in their home or garden and have parents email these photographs to the teacher. ​In K7 students have been using technology to enhance their learning about trees. 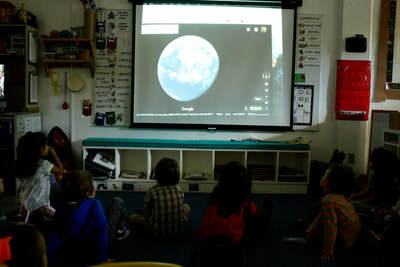 Students watched various children’s videos about the parts of trees, about animals that live in trees, and about different types of forests. 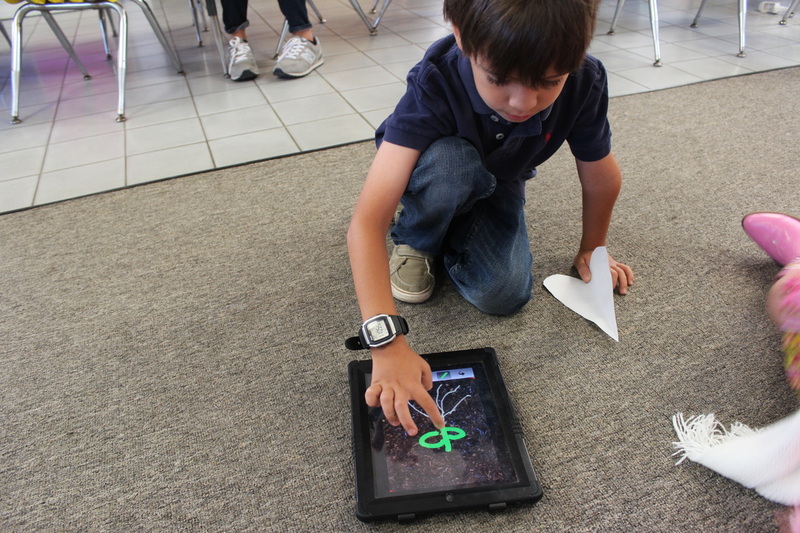 Students were able to use the Smart Board to draw the parts of a tree and drag words to label these parts. 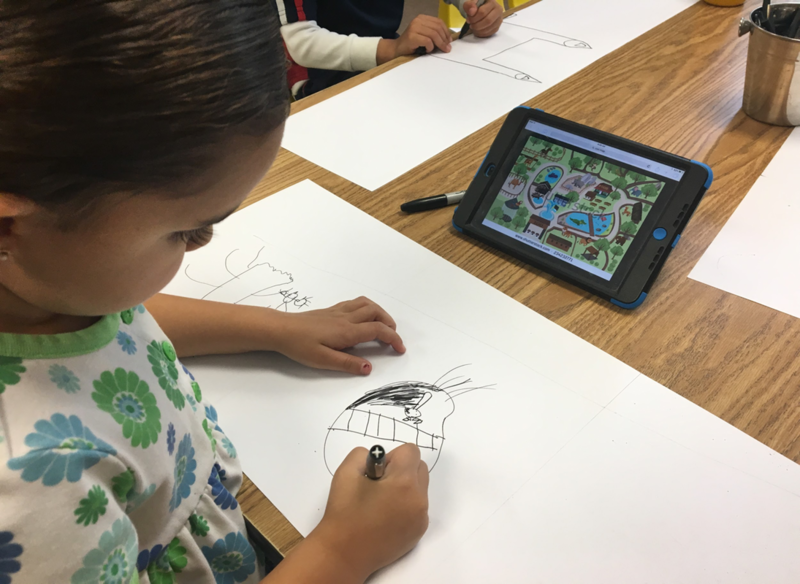 Students used the classroom iPad to take pictures of leaves and of a tree dwelling. They used these photographs when writing descriptive words about trees and creating a classroom tree display. 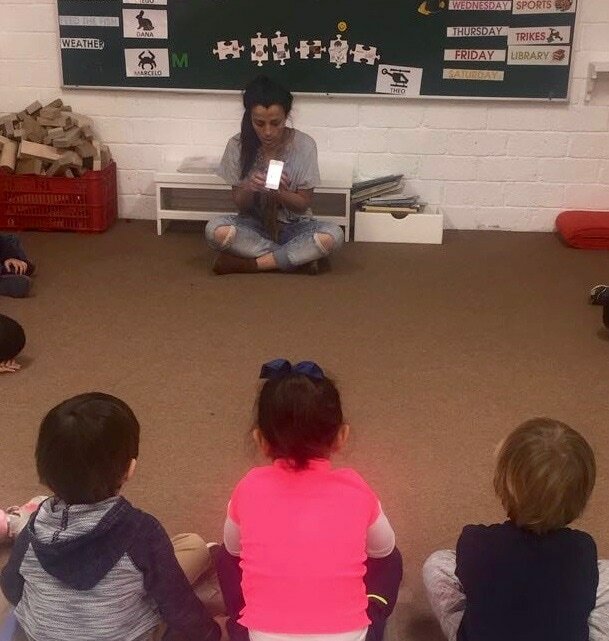 N1 students explored and used WhatsApp to send and receive messages from their teacher, who has been absent due to a surgery. They have been in communication with her, sending good wishes and telling her all about their winter vacation. 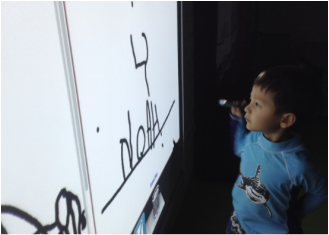 Children have learned a new way of communication and have used technology to be close to their teacher. 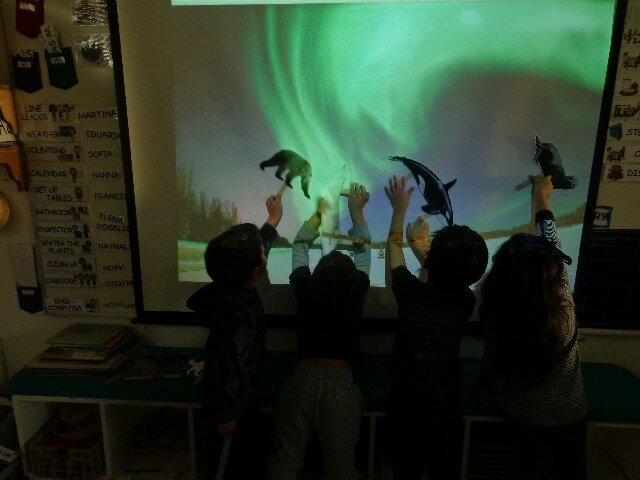 PK5 students have been learning about winter, the animals that live in the Arctic and the Antarctica, and the type of clothes we can use for cold weather. 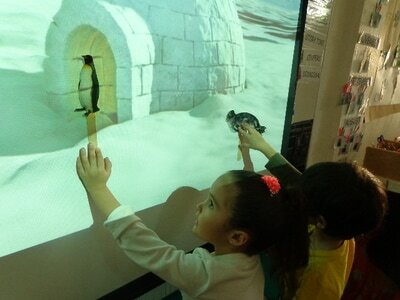 For this project children engaged in many different activities, made winter crafts and checked out books from the library to learn more about Arctic and Antarctic animals, icebergs and snow. We set up an environment with music and animal sounds, winter/snowy photos on the SMART Board and some paper puppets for students to explore this topic further. 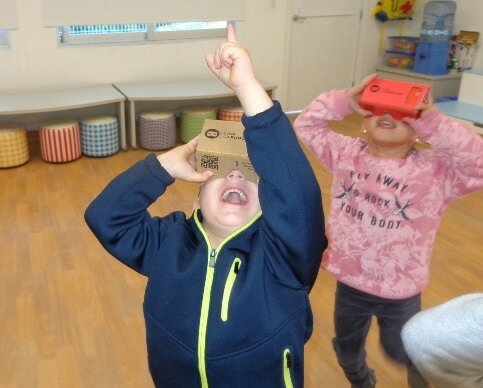 To finalize this project, children used the Google Cardboard viewers to experience virtual reality and get immersed in a journey full of fun environments and experiences in the Arctic! Matías: "Wow! Mira hay un lobo! Hola lobo, hola pájaro!, Miss no me escuchan!" Eduardo: "Yo pensé que los pájaros iban a comerme!" 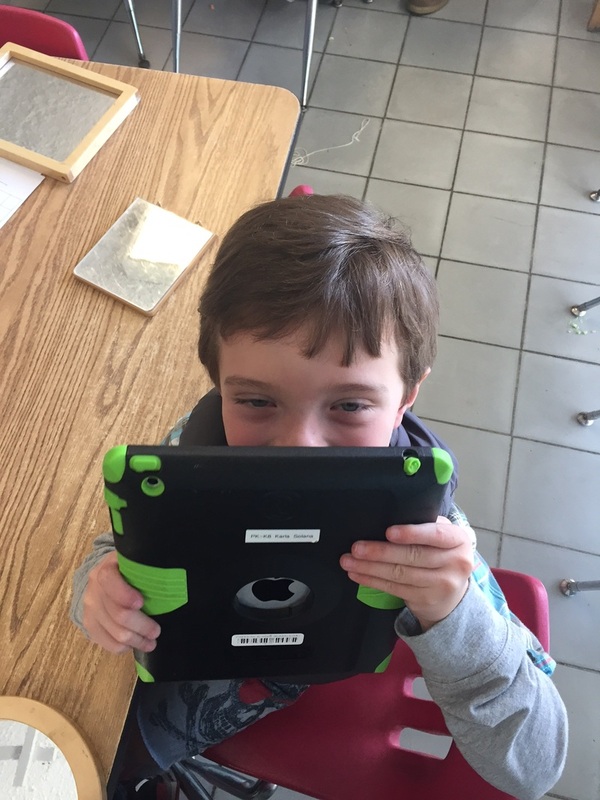 Children, parents, and PK-K 11 teachers helped create our classroom eBook, “Watch Me Grow”, by using the app Book Creator and a voice recorder. 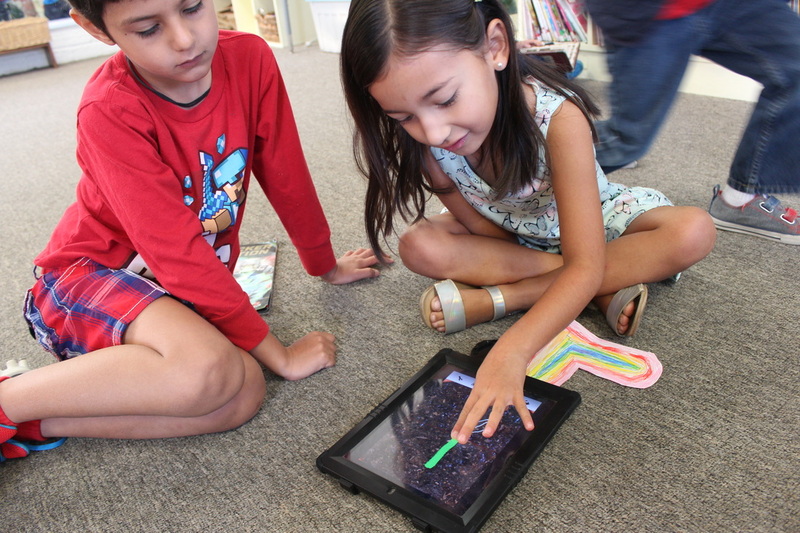 Parents were given directions on how to download the classroom eBook on their own devices through our classroom website. 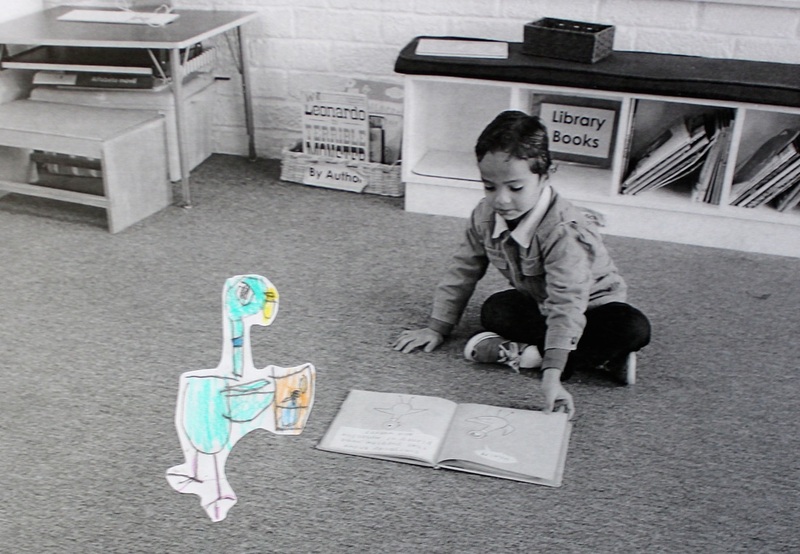 In this video Marcelo and Mateo look at the book and guess whose baby photo they see, listening to the voice recording and then verifying their guess by swiping the page to see if that friend indeed appeared. Mateo and Marcelo independently began repeating the English sentences they heard. 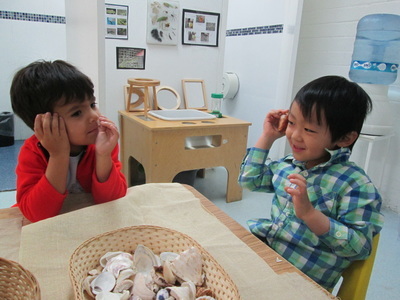 They also found similarities between classmates as they listened carefully to their friends speak in English all the while having fun! This experience allowed children to use technology in a transformative way, as they used the eBook to self-direct meaningful learning. We let our iPad record the process as a “time lapse” as we continued with our activities. After an hour the butterfly was born. 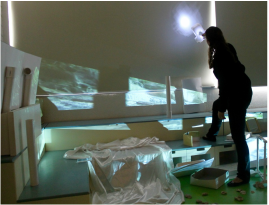 We did not notice until later but luckily, we had everything recorded on video! 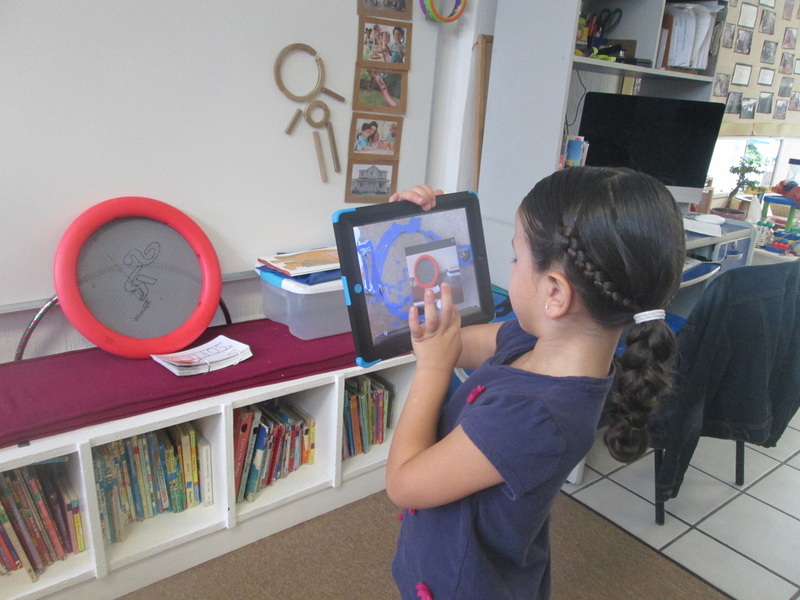 We reviewed our iPad to see the butterfly emerging from its chrysalis. 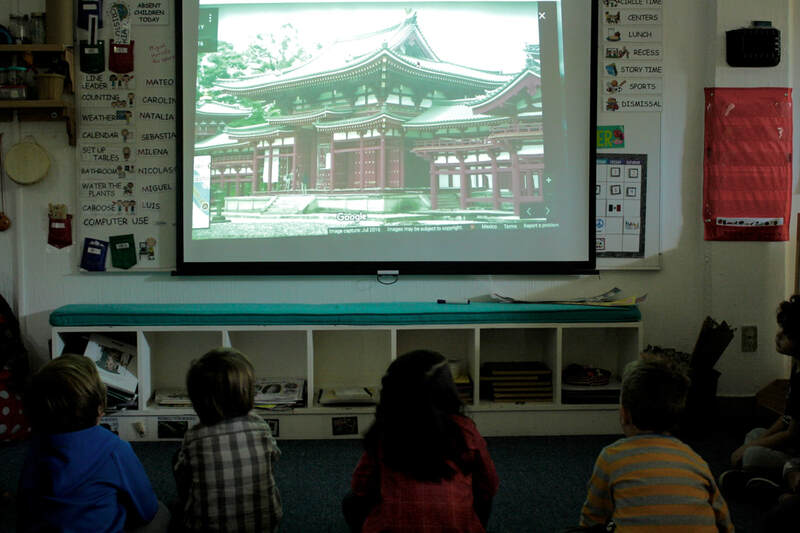 Then we played it on the TV and children asked to see it over and over again. It was amazing! 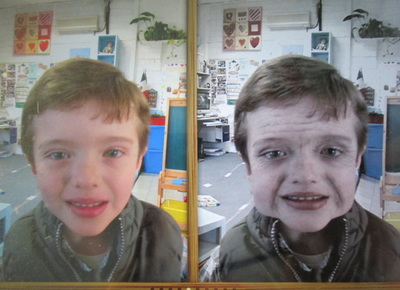 Children were able to capture these incredible changes in their environment thanks to the technology available to us. 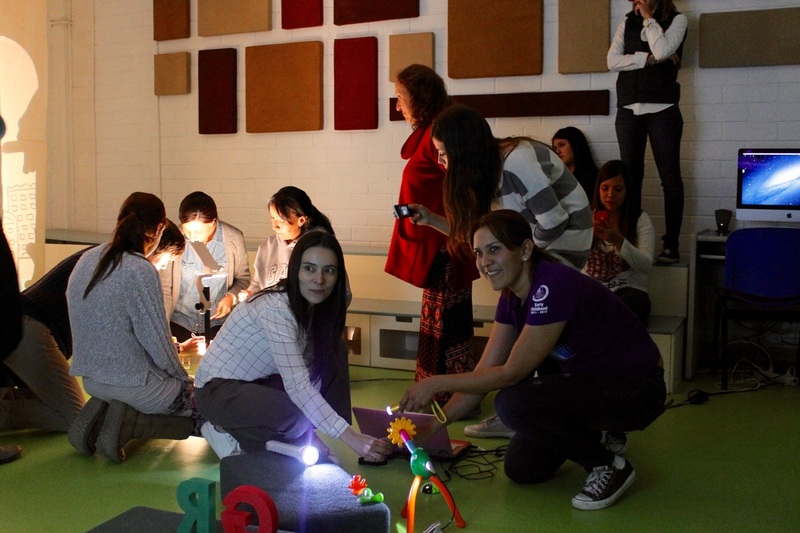 After attending a RedSOLARE’s conference called Viajando con los niños a través de mundos digitales, early childhood teachers presented a workshop for our section’s faculty meant to provoke curiosity and interest in the use of technology with young children. 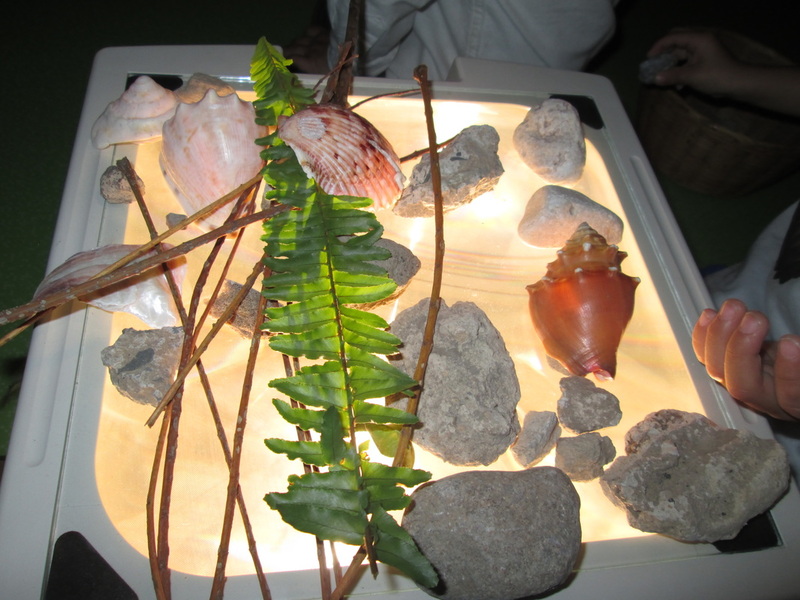 Teachers were brought to a magical, awe inspiring environment created with different materials (flashlights, mirrors, pieces of fabric, plastic shapes, toys) and technological resources (smart board, webcam, an LCD projector, an overhead projector, desktop, and laptop) and asked to interact and explore the possibilities these materials offer young children. 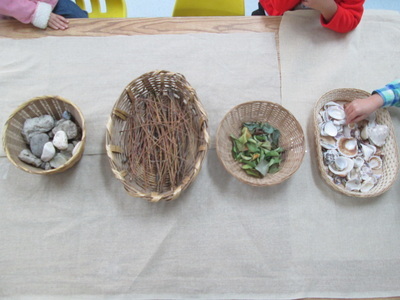 For the first few minutes we asked teachers to do this in silence so that the materials could speak for themselves. 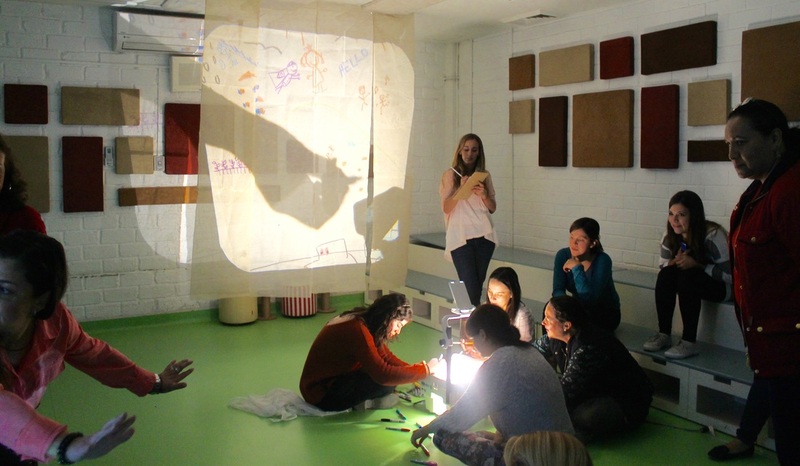 By playing and manipulating light, shadow, shapes, perspective, and movement, teachers created stories, moods, and surroundings and learned how to introduce and better use different technological resources in their classrooms. 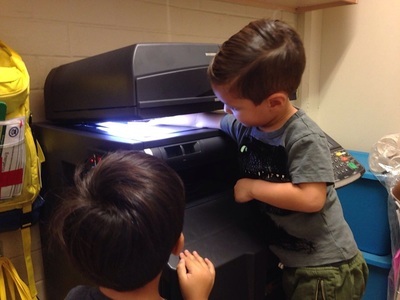 ​Nursery students have been exploring with the section’s copy machine, making copies of drawings and objects like shoes and pencils, …even their own hands! 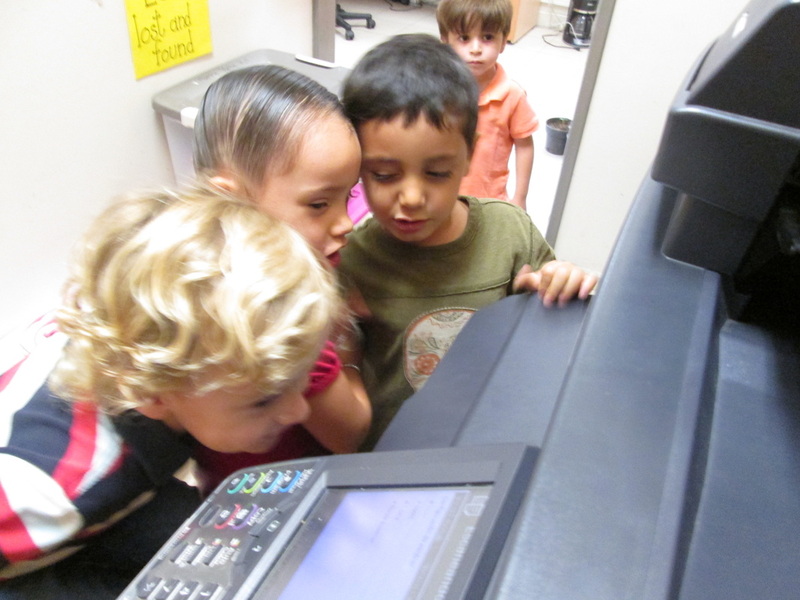 The children were shown how the machine is turned on and off, how to re-fill the paper container, and how to make copies. 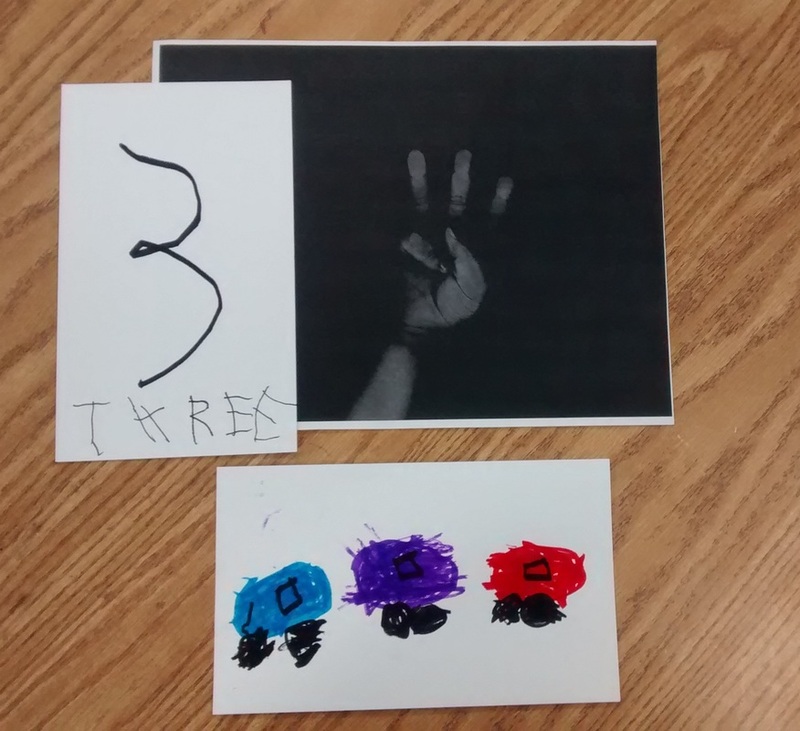 ​After this introduction, we made copies of the children’s fingers showing numbers 1-10, thus linking math and technology. 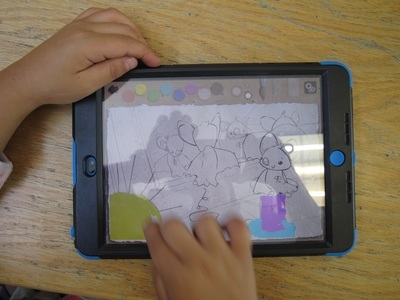 ﻿Nursery 3 has been using technology as an assessment tool. 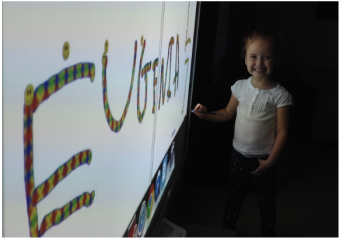 The SMART board was recently used to make a final nursery evaluation of letter skills. 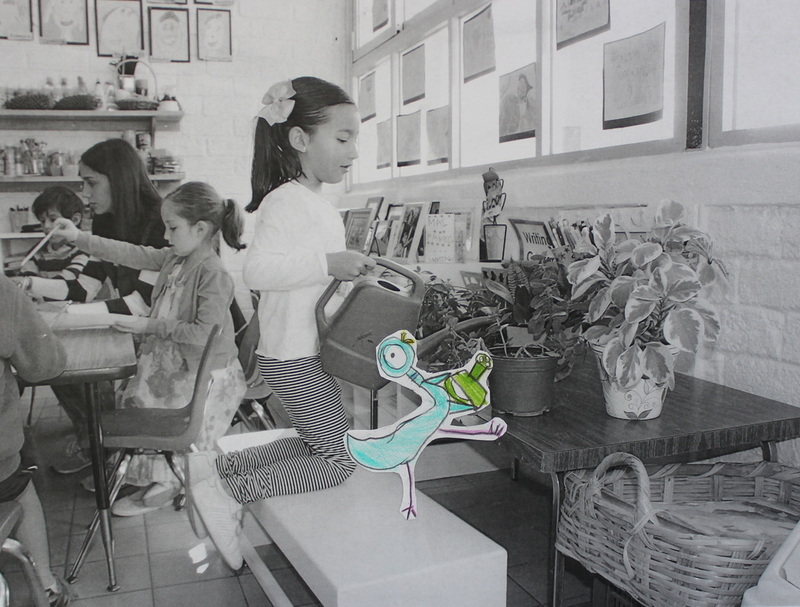 In PK4 we have been encouraging our students to become authors and illustrators. 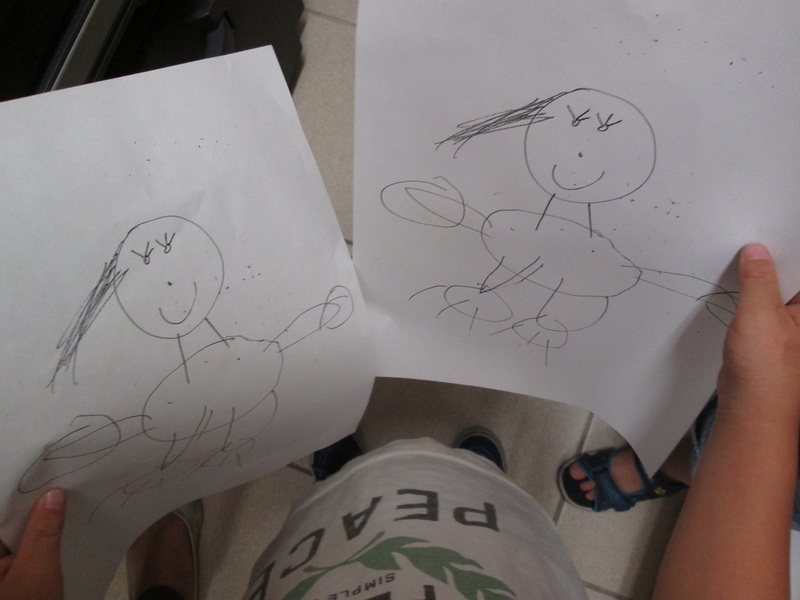 We asked them to write their own book with their parents. They brought their books to school and shared them with the rest of the class and then began interviewing one another and recording each other reading their books with the classroom iPad. They had so much fun! This month, PK5 has been working with the phrase “What do you see?”. 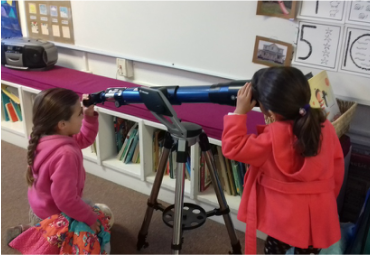 We have been focusing on the idea of what makes up the world around us. The things and people that we see are a part of our learning environment. 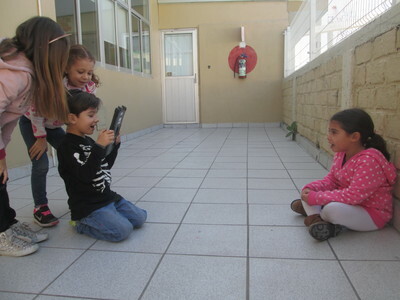 Several “expert photographers” have learned how to use a camera independently and they are teaching their peers how to turn on the camera, zoom in and out and review the photos that they have taken. Children in K6 chose a song to learn for Mother’s Day. 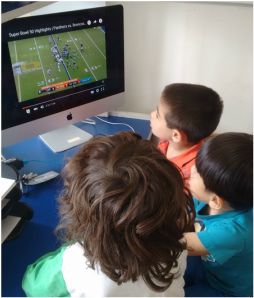 We watched the original video of the song and children got excited about making their own video. 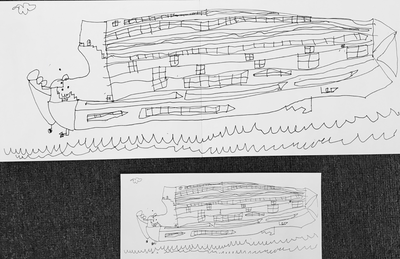 We then talked about the things we needed to know to make the video and the first thing they came up with was that they needed to learn the lyrics for the song, so we looked for them in Google and printed them. 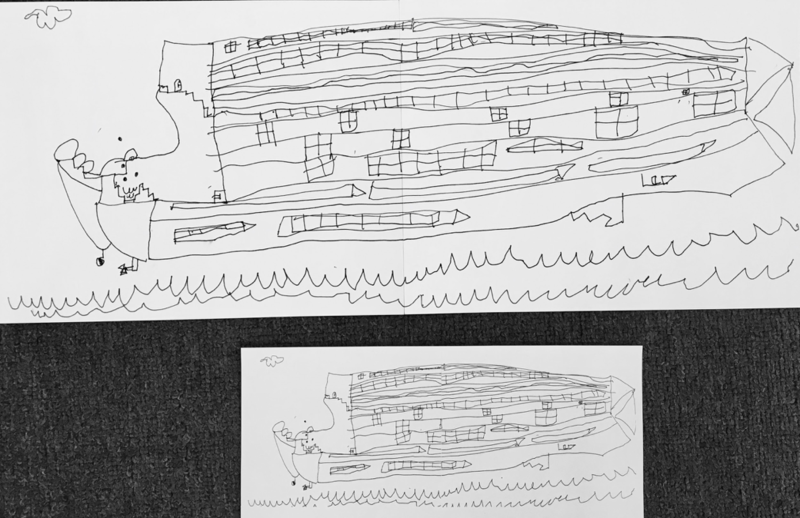 Most of the children were very excited to know they could get the lyrics for most songs and then download them in print. 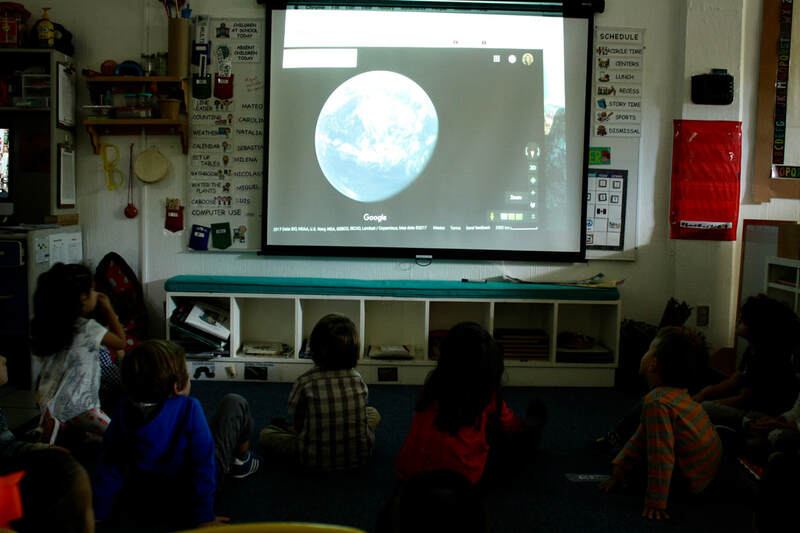 We talked about the importance of using Google and YouTube only with adult supervision. The next thing they wanted to know was the steps to dance along with the song. 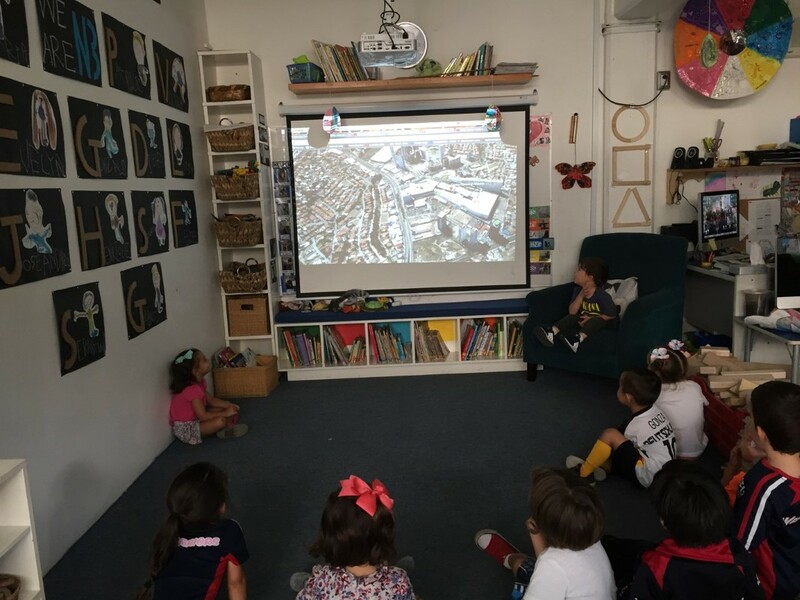 ​We watched some dancing lessons on YouTube and some children made a video to share some ideas with their friends of the steps they could use for the Mother’s Day presentation. Students in K7 used technology to assist them in a unit on homes. 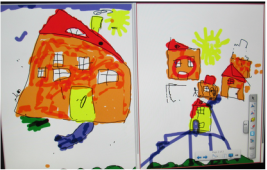 Families sent a photo of the child’s own home that students used to draw a realistic picture. We also used the photos to describe parts of a house and practice speaking in complete sentences in English. 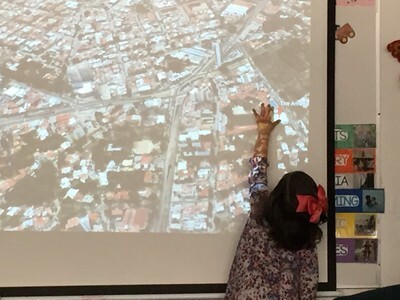 ​Then, we used the computer to map where the children lived in relation to ASFG and in relation to the rest of the world, and finally, the students used the SMART board to draw realistic houses. We have been studying airplanes for several weeks and wanted to use this theme for our Father’s Day gift. We decided to have the children make a special drawing of themselves and their father, flying in a plane/helicopter. 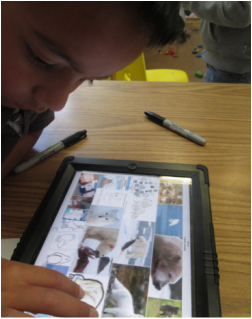 K10 finished their eBook "The Pigeon Goes to School" and can independently access it on the classroom’s iPad in iBook. PK-K11 has shared an example of how technology skills are fostered in an early childhood classroom. En la clase de español, nos hemos enfocado en analizar las diversas formas que un libro es presentado de manera electrónica. Para lograr este objetivo, se les explicó a los alumnos el título de un eBook y qué componentes o aplicaciones vienen inmersas en el mismo para que ellos puedan manipularlo y aprovechar todas las ventajas que ofrece. Uno de los eBooks en español estudiados tiene por título “Tab, el murciélago blanco”. Los alumnos de kínder tuvieron la oportunidad de escuchar la historia por parte de la maestra , analizar las diferencias con la lectura e imágenes interactivas, y también disfrutar de los juegos incluidos diseñados para un mejor raciocinio. 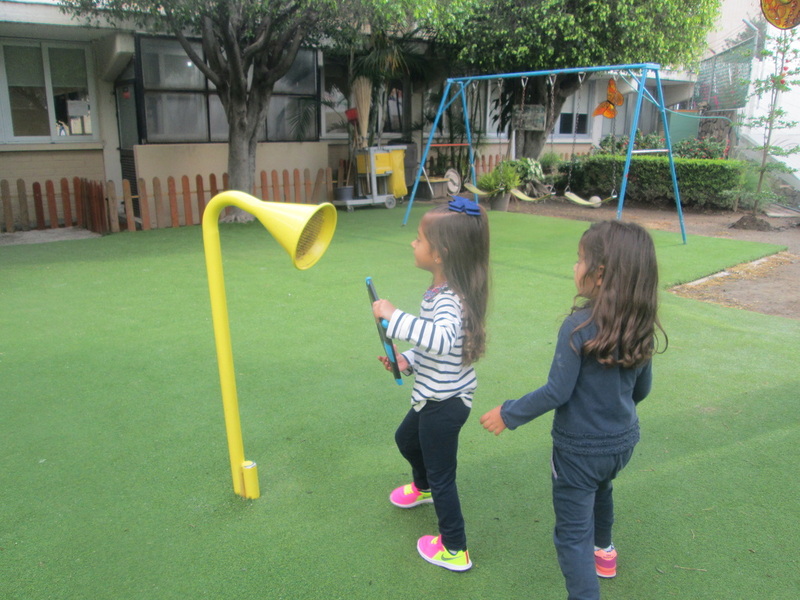 Varios de los alumnos decidieron llevar más allá su aprendizaje y realizar diversas actividades que involucran al personaje principal “Tab”. 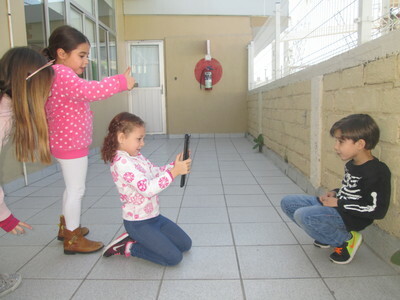 We video recorded each child doing this and showed the videos to the class. 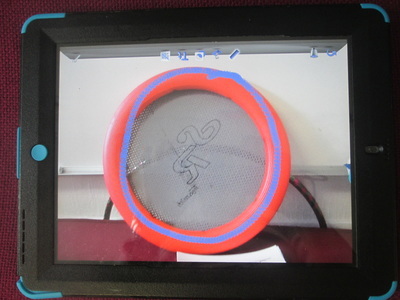 This has motivated children to give this task their best effort. They have enjoyed watching themselves and each other while learning new letter sounds in their friends names. Students in Prekinder 9 filmed videos with the assistance of their teachers to send messages to classmates, parents and friends. 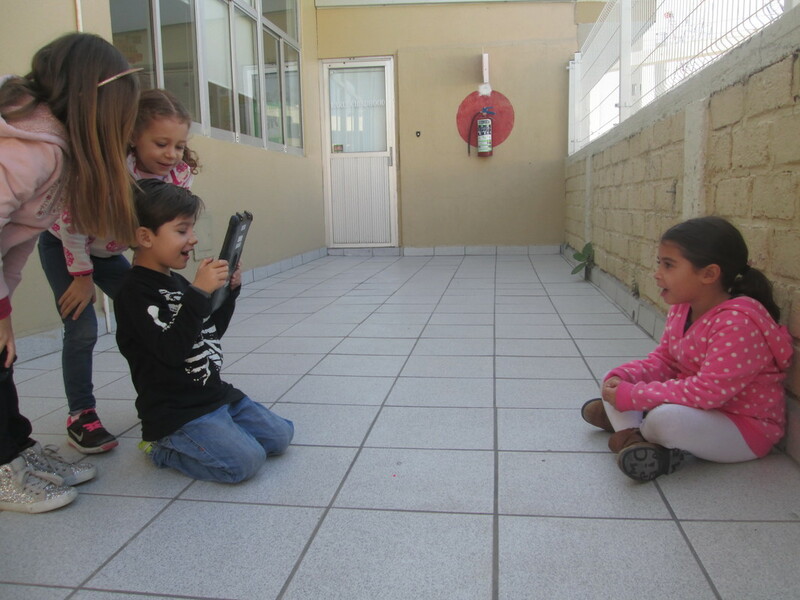 We used the digital camera to record students sending messages. 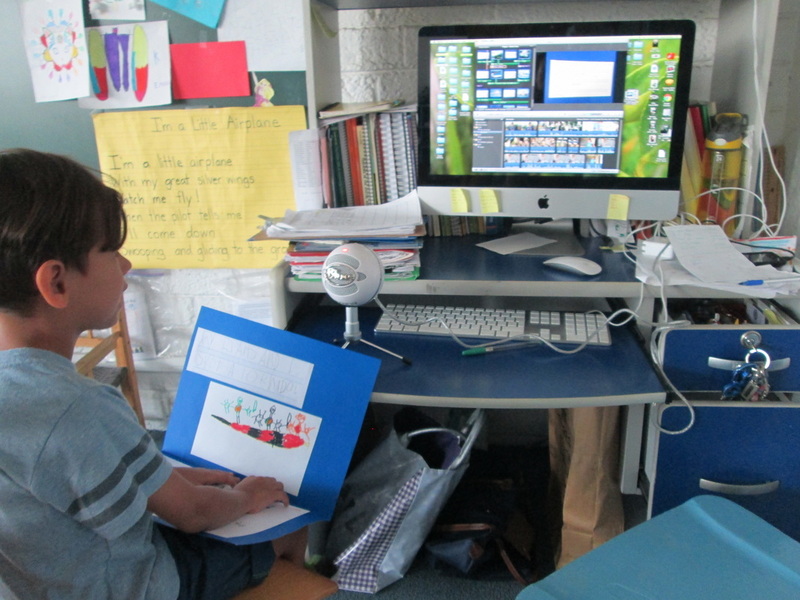 Students reviewed their recordings to see if they could improve it or if they were satisfied with the recording. 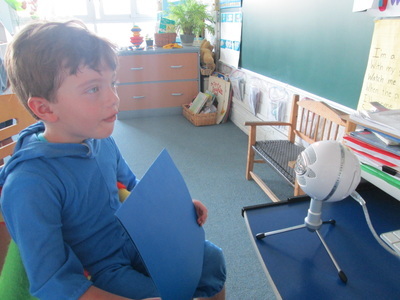 ​We then used these recordings to make short clips to share with friends and family. Students were able to see how their messages were shared with parents and friends on computers and cell phones. The children loved this activity! 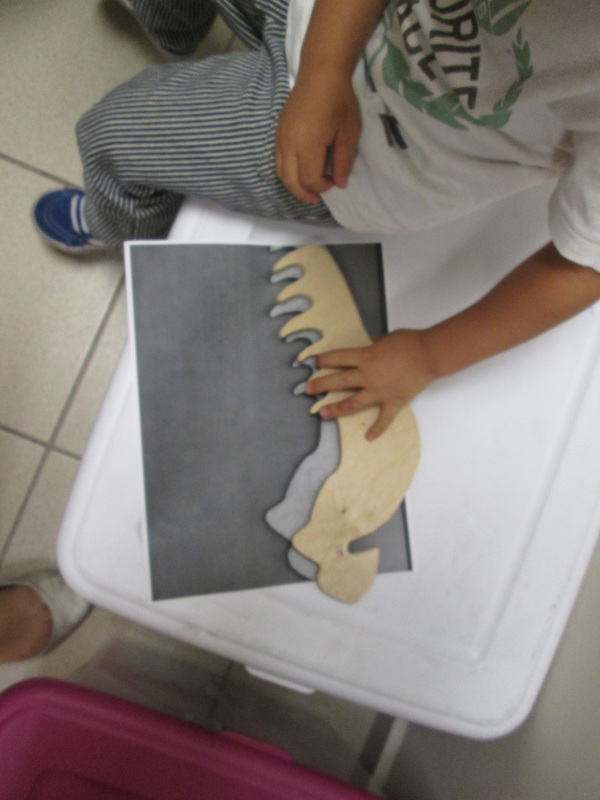 We are studying sunflowers in K10. 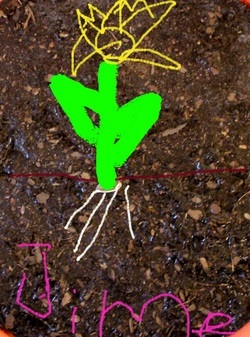 First, we watched a video of a sunflower growing in a time lapse. After that, students took a photo of a seed using the iPad and then used the app Doodle Buddy to draw the roots and the flower growing from the seed. 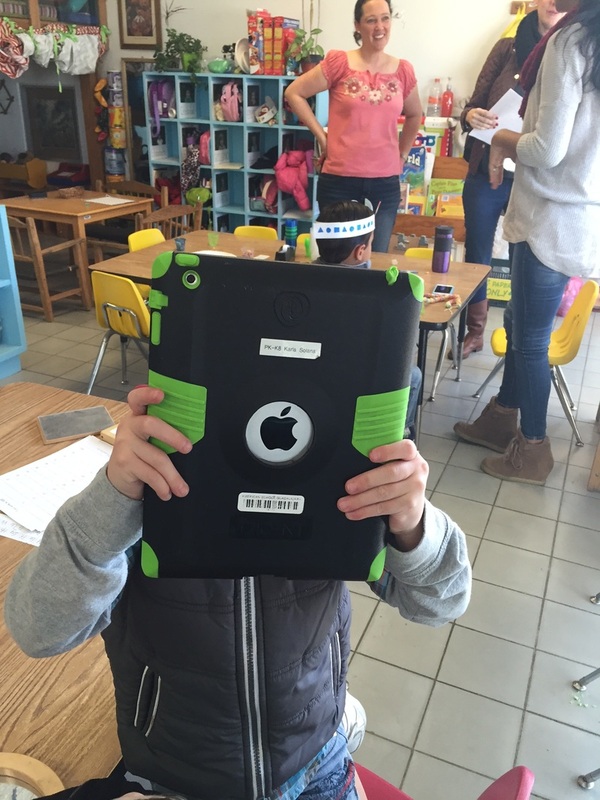 When they finished they saved the photo to the iPad’s gallery. 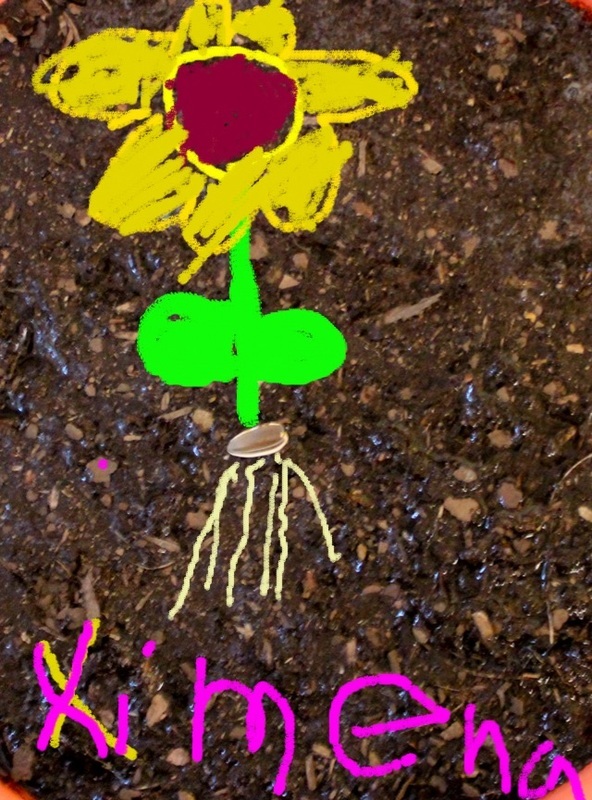 Students enjoyed imagining how the seeds we planted will grow. It also helped them understand the life cycle of a plant using a different media. 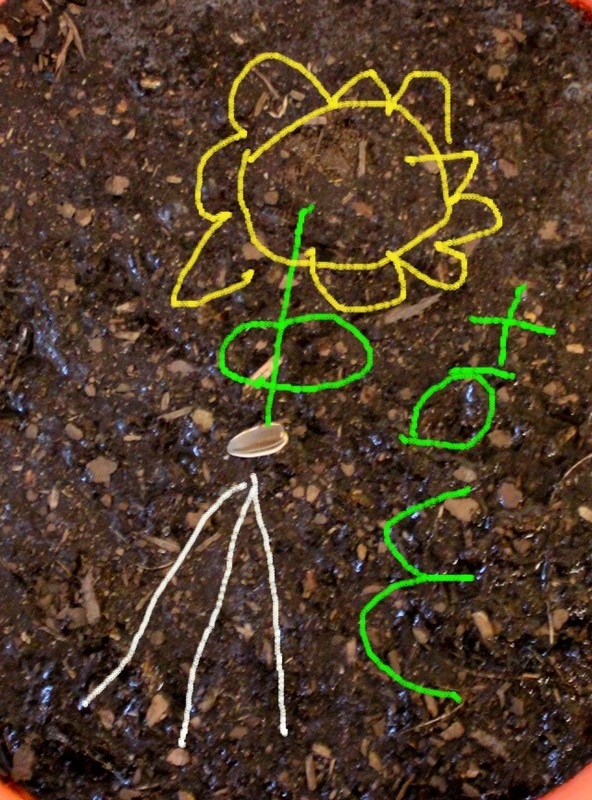 Once our sunflowers grow bigger, we will compare the photos of the children’s drawings to the actual plants and check if their predictions of how the flower would look like were right. En la clase de español, a los alumnos de kínder les gusta utilizar los diversos recursos tecnológicos para comunicarse con sus compañeros de generación que están en otros salones. 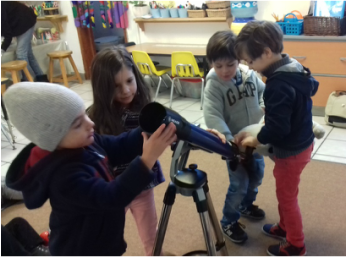 Algunos de ellos se conocen por haber compartido anteriores grados escolares o debido a su convivencia durante el tiempo de recreo. ​Para fomentar aún más esta dinámica y enlazarla a los diversos objetivos de aprendizaje correspondientes al grado kínder, hemos invitado a los alumnos a utilizar el celular para enviar mensajes de voz relacionados a libros leídos por la maestra o para ayudar a comprender un tema en particular. 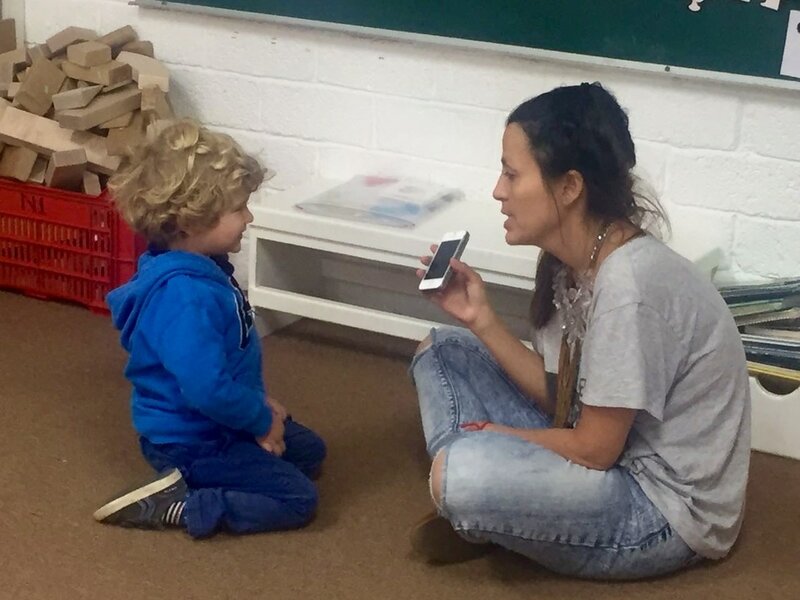 La maestra graba los audios y los comparte con los alumnos de tal forma que surja una conversación entre ellos. 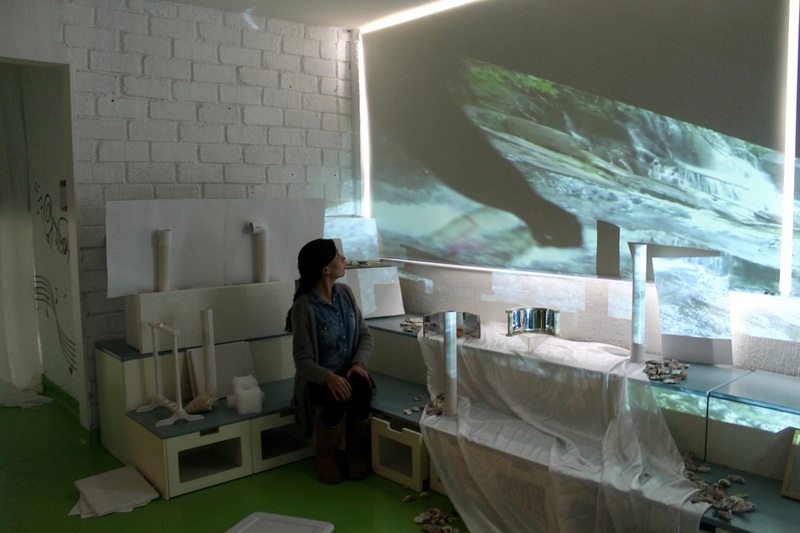 "Un Pueblo Lleno de Bestias"
Los alumnos de kínder también han participado activamente en la creación de sus propios libros o historias. 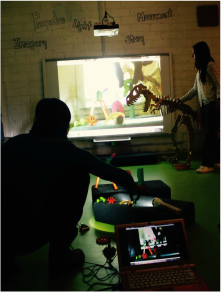 Debido a la experiencia que han adquirido han realizado por iniciativa de la maestra un video en el que comparten sugerencias o tips sobre cómo crear tu propio libro. The projector needs a light and a mirror to work. 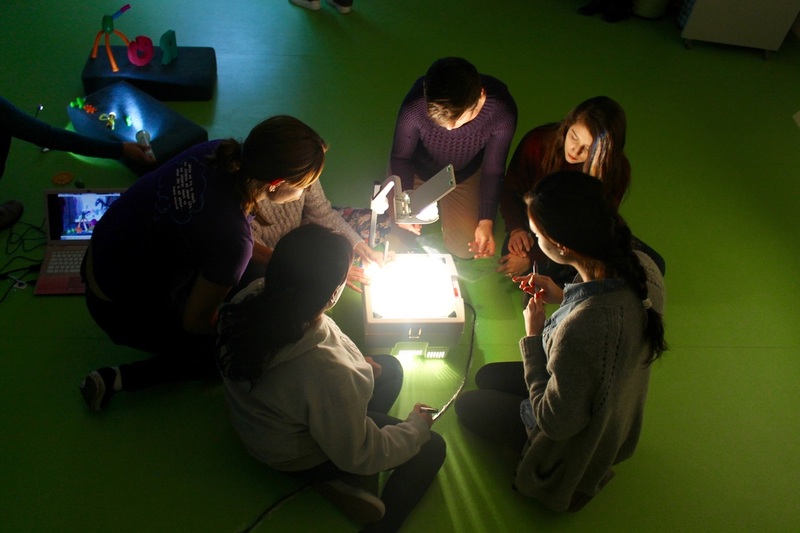 ​The light comes from the light bulb inside the box, and the mirror makes it go somewhere else. The projector is like a TV because images come out of it. 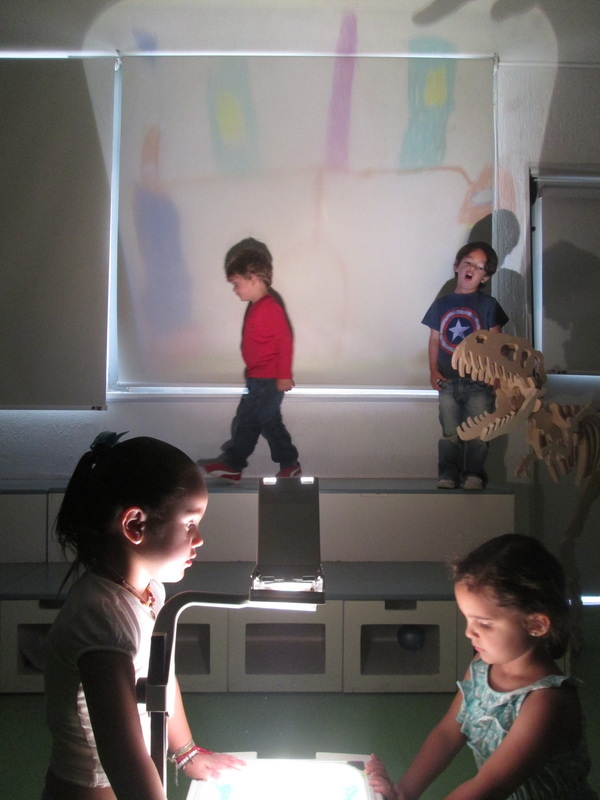 When on the projector, solid objects make shadows and transparent ones make a color. 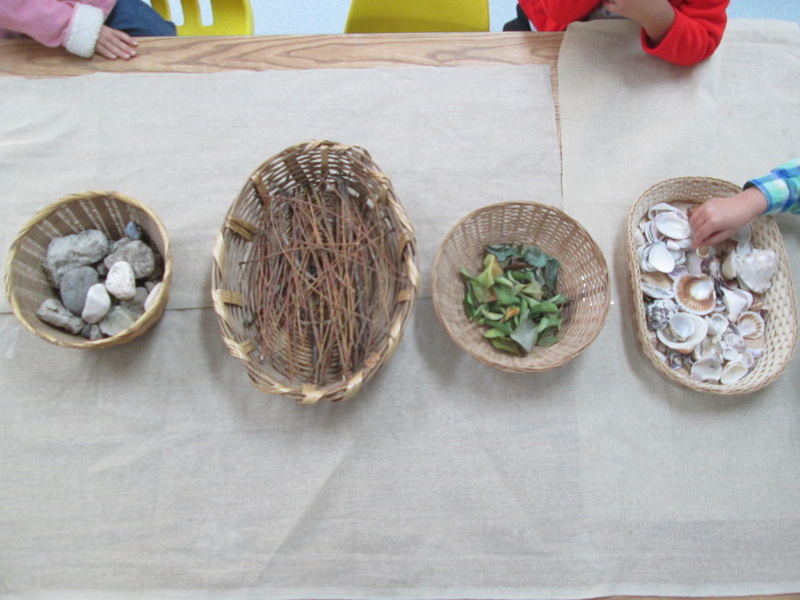 Another day, after playing with objects collected outdoors (rocks, shells, sticks, and leaves) a student said “these make shadows because they’re not transparent”. 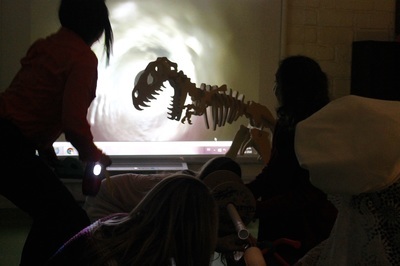 Noticing the connection he was making, we decided to put these objects together with the projector and explore. 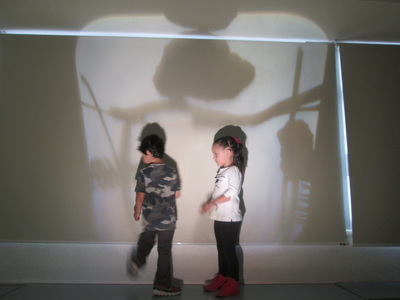 While playing with them and seeing their shadows on the wall, students felt inspired and began creating a story using the shadows reflected as a background. 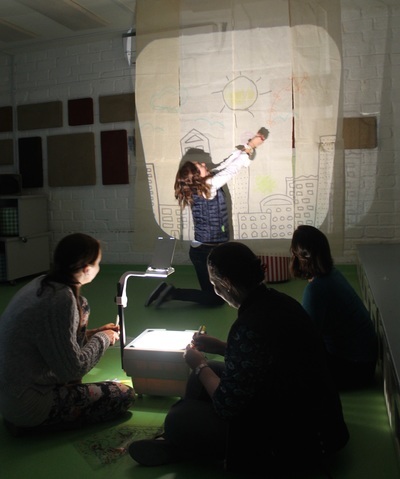 However, I felt they were limited by the possibilities the projector offered, so back in the classroom, students were offered solid paper and acetates to re-create the scenario and characters for their story. 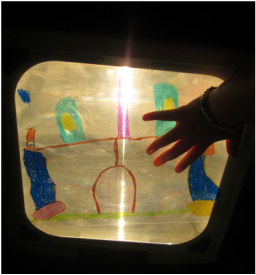 Finally, they used the projector and their drawings on these acetates to tell a story to their friends. The final product, was a beautiful story told by 3-year-old students interacting with technology. Pre Kinder 5 students have been introduced to a listening center in the classroom. 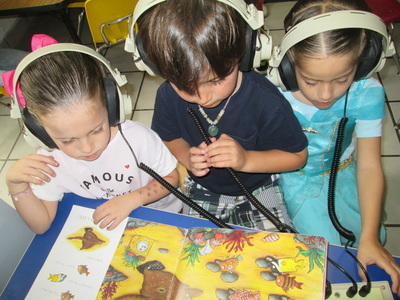 This provides the students with the opportunity to hear their favorite books by their favorite authors, read aloud again and again. We have set up 3 headsets next to the students’ computer so the children can enjoy listening with their friends. 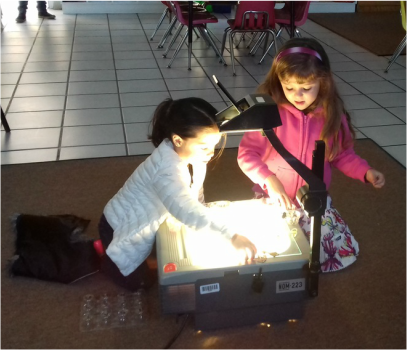 Most of our books have interesting music, and sound effects, and the narrators use silly voices and dramatic ways in which to tell the stories. 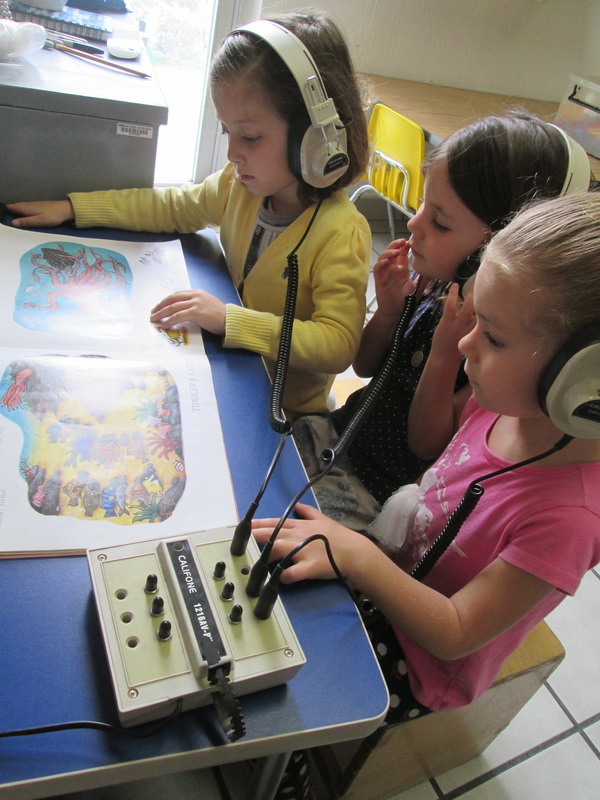 Our students have enjoyed taking turns at the listening center. 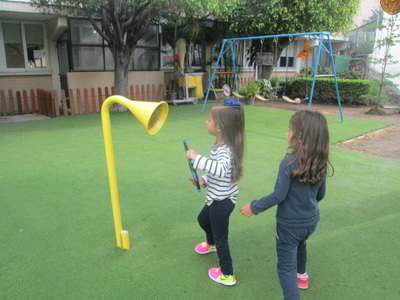 Children in K6 have being learning a song for parent’s day. While searching for the song in YouTube, they discovered a video where girls were dancing to the song. 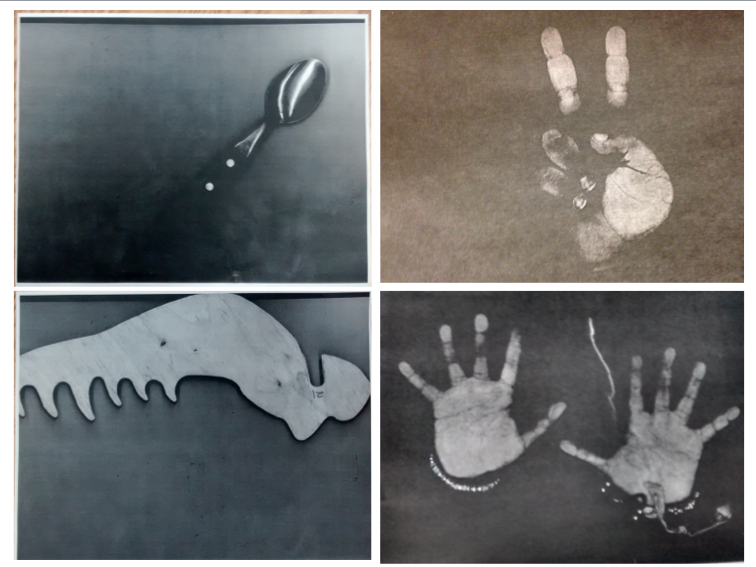 My students decided to copy some of the steps and invent some of their own moves. One student suggested we make a video to show these new dance steps to their classmates in order to help them learn the dance for our upcoming performance. 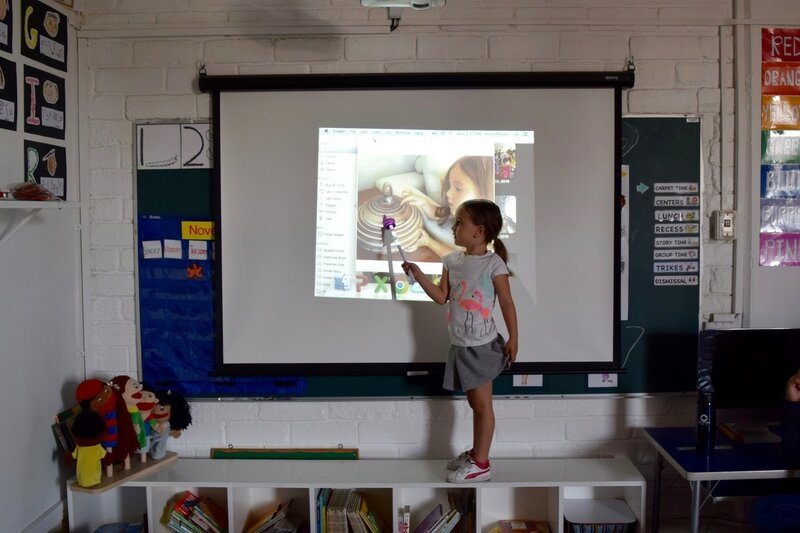 As classrooms have experienced erratic attendance due to the seasonal flu, PK-K 11 students are using technology to bridge distances to share important moments, such as one friend’s birthday celebration. Children learned how to count down from 3 to 0 before speaking. 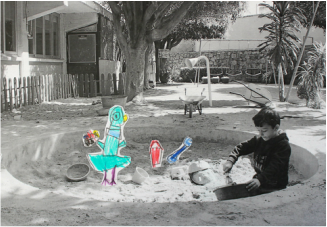 Each group of children picked the background they wanted to use and they figured out how to space themselves out so that the camera can capture all participants in the video. The only hurdle we have yet to overcome is how we can share birthday cake! 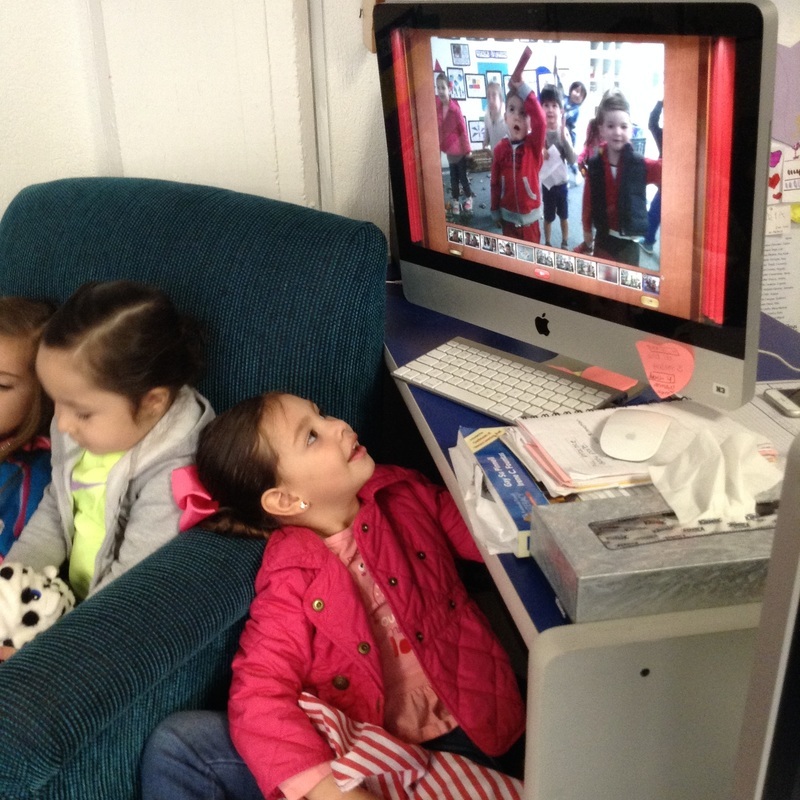 Nursery students celebrated World Read Aloud Day by sharing stories among nursery classrooms with our webcams. 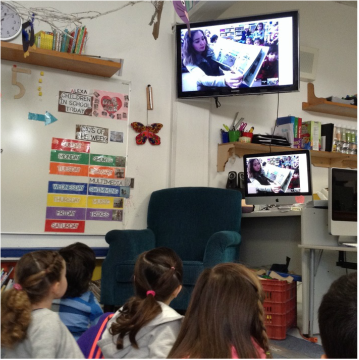 Miss Cynthia from N1 read a story to N3 using their classroom computer and we enjoyed looking at her on the TV. 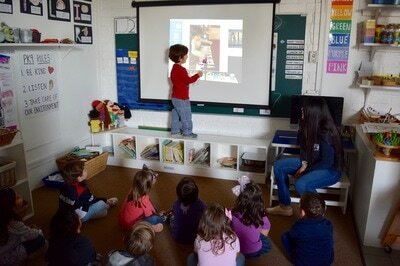 Later on, we read a story to N2 students, and they then read a story to us. For this activity we used our computer webcams to communicate through Google Hangouts. To prepare for this experience, N3 arranged for the webcam to face the carpet so children could watch themselves on the TV screen while they were being recorded. 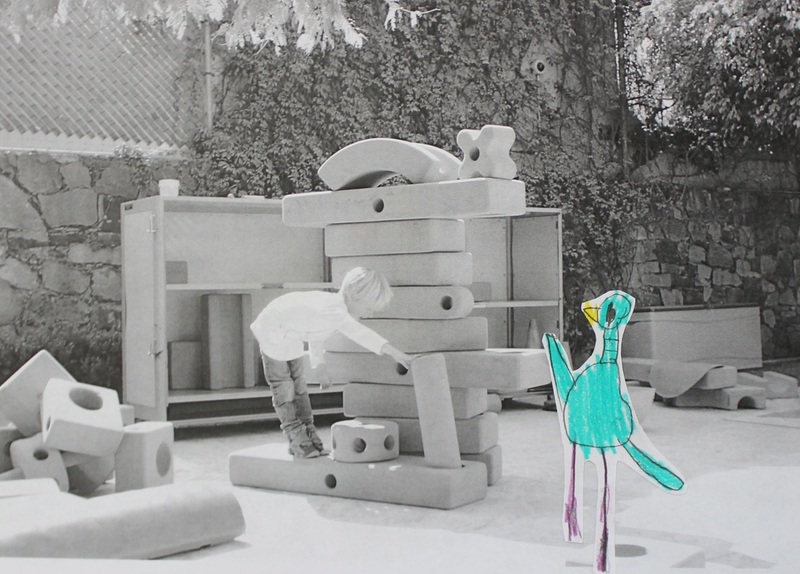 They danced, made faces, and played while trying to figure out how this could happen. 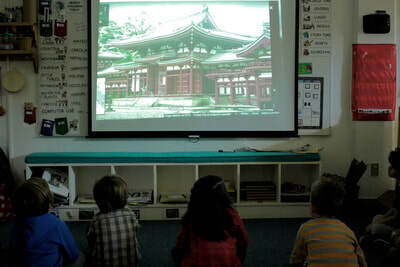 Some students thought about a camera connected to the TV and computer, but they still have not found the camera nor gotten the answers to this “magical” technology, as they called it. We plan on doing more of these fun activities so children can keep playing and discovering how tech devices work. In Pre Kinder 4 we have been working on a Day and Night unit and studying shadows. 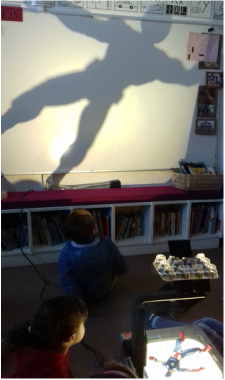 We took out the old overhead projector and allowed children to explore and play with different materials, while moving the objects around and even starting to trace the shadows with a dry erase marker on the whiteboard. 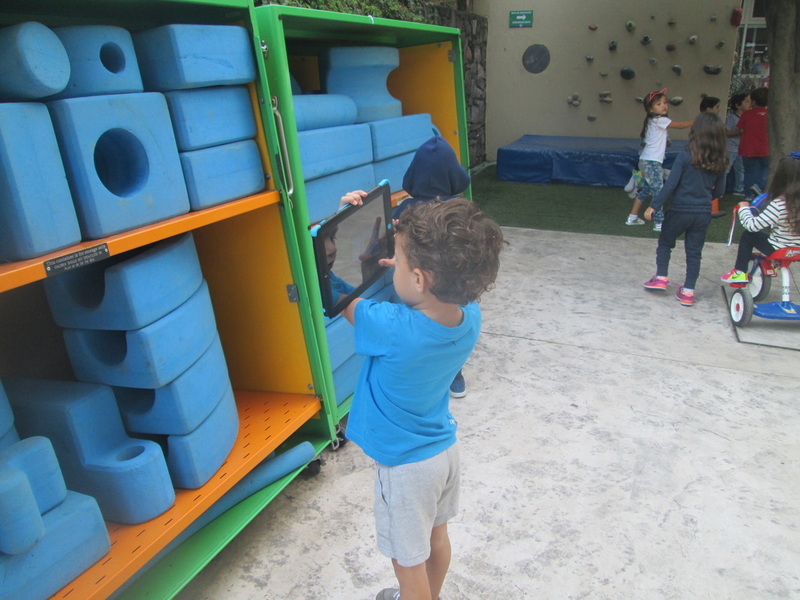 We also watched a video on YouTube to understand a little bit more about how shadows are made and planned an outdoor activity where children searched for shadows around our playground and took photos of the shadows they found with the classroom iPad and camera. They looked at maps online to help them understand where the Arctic and Antarctic are in relation to Mexico. They also found photos of animals to print out. 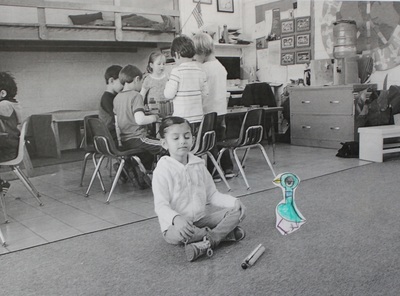 This helped with a final art project where they drew animals in a realistic way. 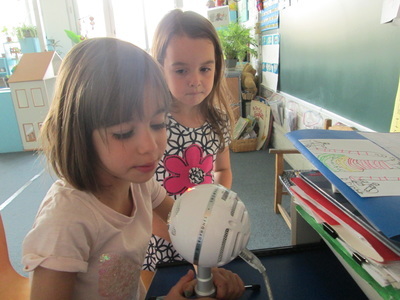 In PK-K8 we’ve been studying several poems, rhymes, and songs for our Balanced Literacy program during the school year. 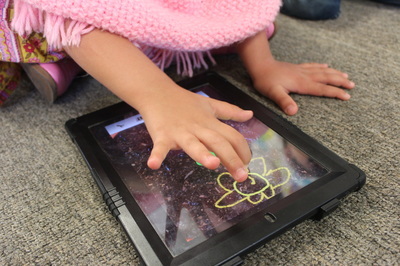 The children have been exposed to them in writing, in storybooks and online. 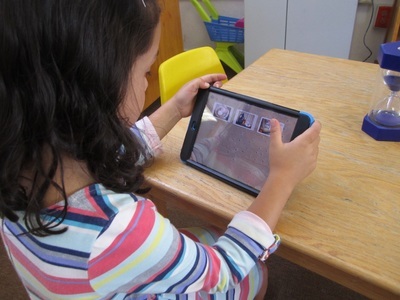 Many students are now confident enough to search for them in the different websites available, such as Starfall.